Mission San Antonio de Padua was founded 14 July 1771 (3rd in order) by Blessed Junípero Serra. 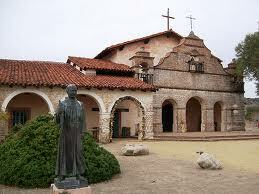 The mission is named for Saint Anthony. The most off-the-beaten-track of the 21 missions, Mission San Antonio de Padua sits in the middle of the Fort Hunter Liggett Military Reservation about half way between U.S. 101 and California Highway 1. You need to take winding county roads to get to it. Southbound on 101 exit at King City and take Jolon Road (county road G14) South 19 miles to Jolon. From there take Mission Road another 5.5 miles or so to the mission. Northbound on 101 exit just past Bradley at the other end of Jolon Road (now county road G18). Travel North 21 miles to Jolon and then take Mission Road another 5.5 miles or so to the mission. (Northbound travelers can take an even more scenic route by exiting on G14 in Paso Robles and taking that past Lake Nacimiento and Lake San Antonio then connect with Jolon road at Lockwood.) In both cases, Jolon itself can be easily missed if you blink at the wrong time so look for the large triangle of three roads coming together at the entrance to Fort Hunter Liggett. Since the mission is in the middle of an active military training base expect the unexpected on the roads: gates, delays due to closure, appearance of military units, etc. Obey all traffic and speed limit signs. The base police seriously enforce all the rules. In 2001 the gate entry to the Fort was unmanned; in 2005 the gate entry was manned and fortified. One needs to show a valid driver’s license, vehicle registration, and proof of insurance in order to enter the Fort and see the Mission [requirements jumped from a picture ID to the three documents in Feb 2006]. Also, there are small roads throughout the area branching off of G14 and G18. Follow the signs carefully to stay on the main roads. (California Landmark 232) GPS coordinates for the Hannon statue in front of the mission: 36°00’31″N 121°15’14″W.